The screens on many mobile phones can leave a user feeling distinctly vision impaired, especially if her attention is divided between tapping virtual buttons and walking or driving. Fortunately, engineers at Google are experimenting with interfaces for Android-powered mobile phones that require no visual attention at all. At Google I/O, the company's annual developer conference held in San Francisco last week, T.V. Raman, a research scientist at Google, demonstrated an adaptive, circular interface for phones that provides audio and tactile feedback. One problem with most graphical user interfaces, says Raman, is that the buttons are in a fixed location, which is inconvenient if you can't feel them. 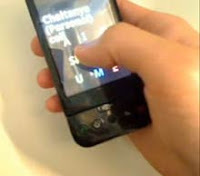 To address this problem, his interface appears as soon as a finger touches the screen, so that it is centered on this initial touch. "We are building a user interface that goes over and beyond the screen," says Raman. Often, eyes-free interfaces are employed for blind users, but Raman, who himself is blind, assures that these interfaces have much broader implications. "This is not just about the blind user," he says. "This is about how to use these devices if you're not in a position to look at the machine."